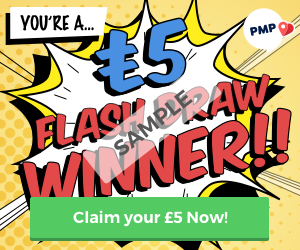 What is the £5 Flash Draw? To celebrate the new “indestructible” £5 note, we added even more chances to win cash every day. The £5 Flash Draw appears in the existing ad slots around the site. There is no special place you need to go to find them, they can appear anywhere! If you see an image like the one below simply click on it and within 7 days you’ll be sent a fiver via PayPal! The image above is an example only. For now at least, Bonus won’t be added to winnings. The winning images will appear randomly in the normal ad slots throughout the day. Clicking normal ads DOES NOT help the winning ones appear. Constantly refreshing pages DOES NOT help the winning ads appear. Winnings will be paid by PayPal, just like the other draws.